With Cora now gone there needs to be a new bad guy, and fortunately they have been introduced. This episode pertains to Storybrooke’s formation even though only Regina knows about it and two campers are a little suspect. See a father and son from New Jersey were camping in Maine when Storybrooke appeared around them. Regina gets bored quickly with how everyone acts the same and no stands up to her. It’s only the outsiders Kurt and Owen who pose any interest to Regina. Basically she takes a liking to young Owen and wants him to stay even if that means by arresting his dad. Regina does managed to arrested Kurt but Owen runs off. When Owen returns with the police but he can no longer see Storybrooke as it’s cloaked or shielded, point is no one can get in unless they are Fairytale people while the curse is active. In Storybrooke. Regina wants revenge on Snow, Rumpelstiltskin tells Regina to get over it as it will cost her Henry. But Regina has a new curse in mind that will make Henry love and will get rid of Snow White. Meanwhile Snow is in a state of deep depression over what she did to Cora. Henry demands Emma and Charming be honest with him but he can’t believe Snow would hurt anyone. Henry then thinks he can blow up the magic to stop all this but Regina tells him he can’t but burns the scroll so she can cast the curse. Snow then asks Regina to kill her as she can’t live with herself. Regina takes her heart but notices a black spot and gleefully tells Snow she will get everything she wants and puts Snow’s heart back. This is all recorded but Greg Mendall who is really little Owen. So Storybrooke was “founded” in 1983 but the 80’s just missed it as it still in its 2010 styling. Just in case you missed 1983-ness of the setting Owen mentions Return of the Jedi and has a ROTJ blanket. Even his name is a Star Wars reference. Anyway episode was ok. It show why Regina wanted to be a mother and set-up Greg/Owen’s motivation. However it does raise one question, you would THINK Regina should have been suspicious of who Henry was if he could get into Storybrooke. Unless she got him and that negates the shield thing. This episode wasn’t as good as previous episode but at it’s best ot was just ok. It was somewhat boring in parts. Gotta be honest this was a weaker than average episode even though some notable things happen. For instance we learn that the “her” that keeps calling Greg is really Tamara, Neal’s fiancee and her being with him was a ploy. Tamara has some plan involving magic. She also has a history with August as they went to same magical guy in Hong Kong and Tamara killed him. August is also fully wooden because his motivations have always been selfish but at the end right thing before he dies, Tamara tried and killed him because he was going to warn Storybrooke, the Blue Fairy turns into a real boy again and yes he is a boy and he forgot what the warning was. Also in addition to being a weak episode the effect work to make August look wooden are really bad. It’s hard to take seriously. Either makeup or a combination or makeup and effects would look better but it was hard to watch puppet August. The episodes send the plot in an odd direction. Regina uses some spell to revert Belle to her cursed self, which didn’t exist, since had amnesia in psych ward. So Belle is now called Lacey, a barfly who hustles people at pool. Sure, Snow White is a caring, sweet teacher and Jiminy is a therapist, while bookish sees the good in everyone Belle is a bad girl with a drinking problem, sure this makes sense. Anyway the point of this episode is to show that Rumpelstiltskin can try and change. Sometimes it works and sometimes it doesn’t, sort of depends on who is he with. 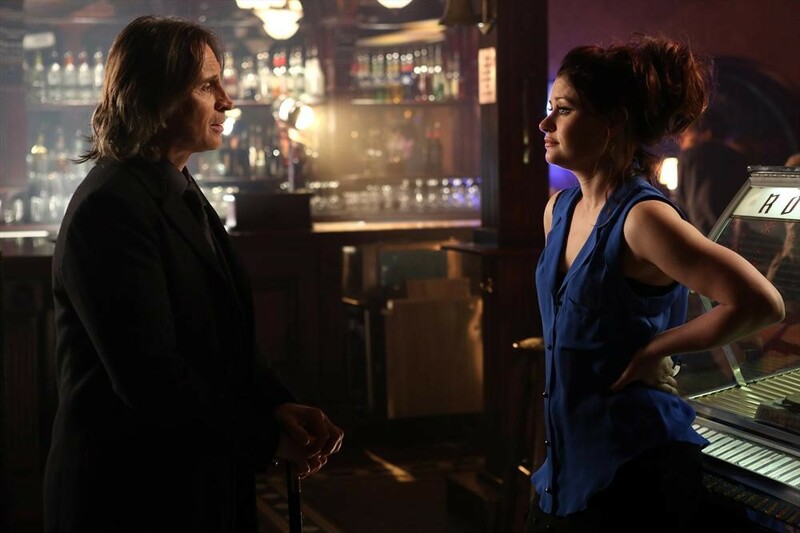 So while Belle shows the good in Rumpelstiltskin, Lacey likes the bad Dark one. Also Tamara reveals she has a captive Hook. Emma is introduced to the magic bean crop and Regina finds it. In the character’s past Robin Hood steals from Rumpelstiltskin and Rumple tortures him, as he does. Belle frees him and Rumple gets mad and decides he going to track down the thief and kill him to prove a point to Belle. Turns out Robin stole from Rumpelstiltskin to save his dying pregnant wife. Rumpelstiltskin then spares him and Belle feels vindicated, as she does. Not sure why Regina bother with reverting Belle to her cursed form. What good did that do her? We also see that bow that never misses its target again and Robin Hood is introduced. It’s was an ok episode but Rumpelstiltskin is pretty much the best character, so episode centering around him are mostly always a bit better. 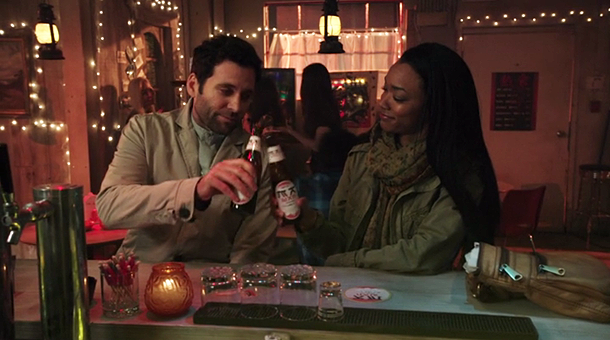 Side Note – Trying three episodes at a time since there is two weeks left in March. Since I want to caught up and string these post along for another year, there will be two posts of OUAT a week now, once on Mondays and once on Thursday. The exception will be weeks where the seasons ends, which mean post will be once a week on Thursdays.